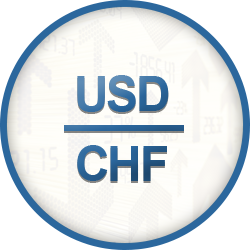 The fifth most traded pair in Forex and binary options, the USD/CHF is cross between the Swiss currency (Swiss Franc) and the currency of the USA (U.S Dollar). This pair is also known as the 'Swissie' amongst traders. For any trader doing currency trading activities in binary options, looking at the market price of the pair that he/she wishes to trade is the first step to take. If the market rate for the USD/CHF pair is 0.8985, this means that it takes 0.8985 Swiss Francs to buy 1 U.S Dollar. The CHF is commonly seen as a safe haven – meaning that when traders expect the markets to take a hit following adverse news, the shared consensus is to turn to the Swiss Franc for any currency trading activity. The currency’s low inflation curve, low levels of unemployment and other factors contribute to its attractive unique features. Any trader who wants to trade this pair will need to have some trading experience. A USD/CHF forecast is necessary through technical analysis, further verified through fundamental analysis. Even though this pair only accounts for 4% of the global trading volume, it is still seen as an important pair because of the attributes of the pair’s respective economies. The U.S Federal Reserve has the power to affect this currency pair by taking a decision to behave or move in a particular way and alter the open market with the intention of strengthening the U.S dollar – thus making the pair’s value rise. On this page, you can find all of the relevant USD/CHF charts which will help you put together a USD/CHF forecast, helping you make more informed decisions for your currency trading activities.